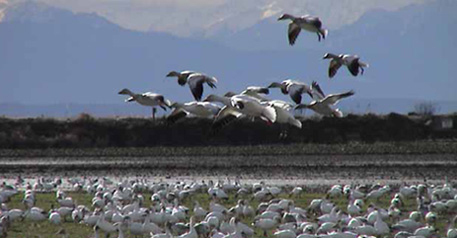 The Washington Waterfowl Association (WWA) has finalized a business plan for private land/public access program called Heritage Lands. The program idea came from a multi‐stakeholder work group developing mitigation options for the farmland and public access losses resulting from fish restoration projects in the Lower Skagit and Stillaguamish River Deltas. The primary tenant is the purchase and preservation of farmland. Why preserve farmland...well other than the obvious production of food in a world of growing population, if duck hunters don't have farmland, we won't be hunting fields. While there are miles of fields in some areas, we are watching some of the best farmland in the world become industrial, commercial, and residential areas, like the Kent Valley south of Seattle. Once the farmland is owned by WWA, it is to be leased back to farmers so it is farmed and managed for farming. The lease fees paid to WWA then are returned directly to the farmland to manage public access and bird hunting, such that the farmer's access and crops are not harmed and agricultural production is not decreased on the land. How many acres is enough? Well, the initial goal is 1,000 acres in the north Puget Sound area. This area is the primary focus area due to recent losses of public hunting access and waterfowl management capabilities due to intertidal restoration projects at historical waterfowl management properties. At about 400 acres the program begins to pay for itself. At 1,000 acres there is money to build a funding base such that the program can be implemented in other areas of the state. We need your donation. Every little bit counts. Don't think that your $10 or $20 won't make a difference. For more information, or to donate, contact Rone Brewer at (206) 595-7481; nwducks@frontier.com, or see the links below. Please download our Heritage Lands flyer for more information! The flyer is in PDF format. Want to contribute? Click here for more information.